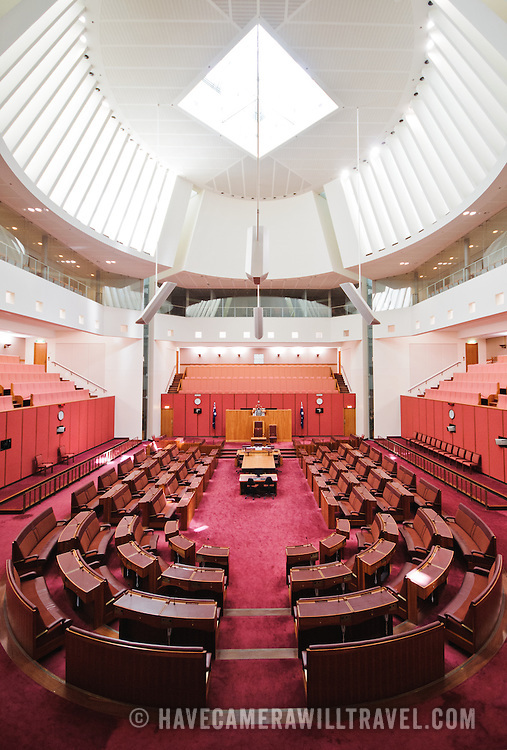 The Senate building follows the colour scheme of the House of Lords, decorated in red, this time muted to tints of ochre, suggesting the earth and the colours of the outback. Parliament House is the meeting place of the Parliament of Australia. It is located in Canberra, the capital of Australia. It was opened on 9 May 1988 by Queen Elizabeth II, Queen of Australia. Its construction cost was over $1.1 billion. At the time of its construction it was the most expensive building in the Southern Hemisphere. Prior to 1988, the Parliament of Australia met in the Provisional Parliament House, which is now known as "Old Parliament House".